If you are looking for a healthy and delicious recipe with the flexibility to make ahead of time, you are in the right place! Butternut squash used to be one of the vegetables that never went on my grocery list until I came across a restaurant menu that had butternut squash soup on the list. I tried some readily available online recipes and altered the spices every time to come up with my favorite version. 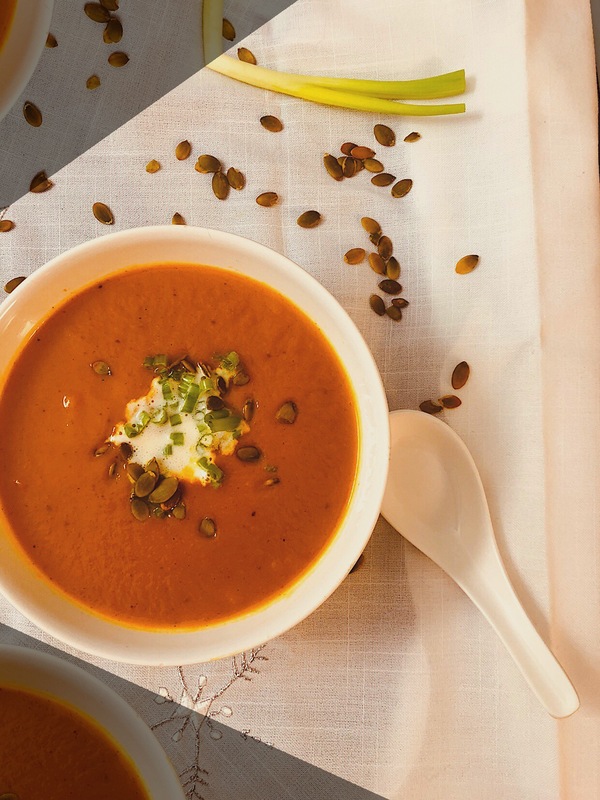 The right blend of spice level is the key of this recipe to adjust the natural sweetness of the butternut squash and to bring flavor to the soup. Butternut squash can be a bit intimidating to peel and chop due to its hardness, so the easiest way is to just cut it to half, roast the halves and then scoop out the pulp. I have tried multiple methods to puree of the pulp, the best method that gives a creamy texture is to blend all the ingredients and the pulp in a high-speed blender. This recipe results in a rich and creamy roasted butternut squash soup (without the use of actual cream). It is also a great make-ahead option. In fact, this soup is one of those meals that tastes even better the next day. Start with preheating the oven to 375 degrees Fahrenheit. Cut the butternut squash vertically into approximately equal halves and remove the seeds. You can discard the seeds or roast them and save them for garnishing. Chop the carrots and onion into larger chunks. Place the butternut squash halves, chopped carrots, and onions in a baking tray. Drizzle olive oil just enough to coat the squash halves on the inside and some to coat the carrots and onions. Sprinkle the minced garlic, crushed black pepper, cayenne pepper, and salt. Place the squash halves upside down. Bake for 40-50 mins flipping the carrots and onions after 20 mins so that they do not burn. Bake the squash till it is tender and completely cooked. Let it cool so that it is comfortable enough to handle. Use an ice-cream scoop or a large spoon to scoop the pulp of the cooked squash. Transfer the squash pulp, roasted carrots and onions to a blender, add vegetable broth, carrom seeds, salt and blend on high speed for 2-3 mins till the texture is creamy. You can serve straight out of the blender or store it in the refrigerator for later use. Optional – In a saucepan add butter and the pureed soup, stir in some water or vegetable broth to adjust consistency and bring to boil. Serve hot by garnishing with red chili flakes and some pumpkin seeds to add a crunch.